514 pages | 95 B/W Illus. 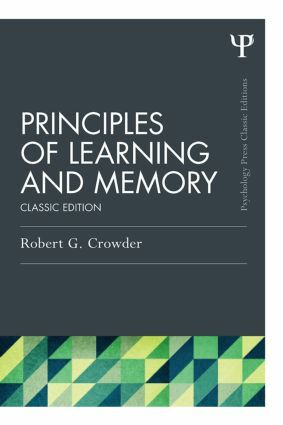 In this landmark volume from 1976, Robert Crowder presents an organized review of the concepts that guide the study of learning and memory. The basic organization of the book is theoretical, rather than historical or methodological, and there are four broad sections. The first is on coding in memory, and the relations between memory and vision, audition and speech. The second section focuses on short-term memory. The third is loosely organized around the topic of learning. The final section includes chapters that focus on the process of retrieval, with special attention to recognition and to serial organization. Crowder presumes no prior knowledge of the subject matter on the part of the reader; technical terms are kept to a minimum, and he makes every effort to introduce them carefully when they first occur. It is suitable for advanced undergraduate and graduate courses. Foreword to the Classic Edition by Henry L. Roediger, III, and James S. Nairne. Background Comments and Three Analytic Concepts. Iconic Memory. Echoic Memory. Recoding by Speech in Short-Term Memory. Nonverbal Memory. Primary Memory. Forgetting in Short-Term Memory. The Interference Theory of Forgetting in Long-Term Memory. The Effects of Repetition on Memory. The Organization of Memory in Free Recall. Retrieval. Serial Organization in Learning and Memory. Robert G. Crowder (1939-2000) was an outstanding and pioneering psychologist in the great functional tradition of American psychology. During his career at Yale University, he made major contributions to many topics in cognitive psychology, including memory, learning, the psychology of music, and the psychology of reading. He received numerous academic honors and many of his students went on to have significant careers in the field. His bibliography includes landmark volumes, including Principles of Learning and Memory (1976), which was the first attempt to summarize the field in over two decades. The Psychology Press & Routledge Classic Editions series celebrates a commitment to excellence in scholarship, teaching, and learning within the field of Psychology and related areas. The books in this series are widely recognized as timeless classics, of continuing importance for both students and researchers. Each title contains a completely new introduction which explores what has changed since the books were first published, where the field might go from here and why these books are as relevant now as ever. Written by recognized experts, and covering core areas of the subject, the Psychology Press & Routledge Classic Editions series presents fundamental ideas to a new generation.